To Cite: Heidari Z, Mahmoudzadeh Sagheb H, Sheibak N. Association between TGF-Beta1 (-509) C/T Gene Polymorphism and Tissue Degradation Level In Chronic Periodontitis: A Stereological Study, Gene Cell Tissue. 2015 ; 2(3):e31698. doi: 10.17795/gct-31698. Background: The recent years has seen enormous research attempts in the study for genetic factors that may predispose individuals to periodontitis, as one of the most common chronic infectious disease in humans. Objectives: The aim of the present study was to determine the breakdown of interdental gingiva tissues in chronic periodontitis patients with TGF-β1 (-509) C/T polymorphisms. Patients and Methods: A total of 60 gingival samples, including 45 patient and 15 healthy subjects, were selected for this study. Following determination of TGF-β1 (-509) C/T gene polymorphism by Tetra primer amplification refractory mutation system-polymerase chain reaction (T-ARMS-PCR), the patients were divided to three subgroups according to their genotype (6 TT, 21 TC and 18 CC). After tissue processing, sectioning and staining, quantitative parameters were estimated by Cavalieri’s point-counting estimation. Results: The Volume density (Vʋ) of epithelium, connective tissue, collagenous and non-collagenous matrix and blood vessels had statistically significant differences between the control and chronic periodontitis (CP) groups (P < 0.0001). Statistically significant differences in the Vʋ of collagenous matrix, non-collagenous compartment and blood vessels between TT, TC and CC groups were found (P < 0.0001). There were no statistically significant differences in the Vʋ of epithelium, connective tissue of gingiva and non-collagenous matrix between TT, TC and CC groups (P > 0.05). Conclusions: The results of the present study showed that TGF-β1 (-509) C/T is strongly associated with quantitative parameters of connective tissue constituents of interdental papilla in CP patients. The recent years has seen enormous research attempts in the study for genetic factors that may predispose individuals to periodontitis, as one of the most common chronic infectious disease in humans (1-3). The most frequently occurring form of periodontitis is chronic periodontitis (CP) that is caused by periodontopathic bacteria. Chronic periodontitis is the most prevalent infectious disease, characterized by a devastating inflammatory condition that affects the periodontium, slowly destructs the alveolar bone, forms periodontal pockets, and finally leads to tooth loss (4-6). Histological analysis has demonstrated that during periodontal diseases inflammatory cells accumulate in the gingival connective tissue (5, 7, 8). During periodontal inflammation, periodontal ligament and gingival fibroblasts secrete high levels of cytokines. Cytokines are inflammatory mediators, which are involved in the regulation of immune and inflammatory responses (2, 9-11). Cytokines have important effects on many biological functions such as proliferation, development, homeostasis, regeneration, repair, inflammation and regulation of the immune response (5, 9, 12). One of the cytokines released by stimulated inflammatory cells during tissue injury is transforming growth factor β (TGF-β) (2, 4). Transforming growth factor β is a multifunctional cytokine that has a regulatory role in a broad spectrum of cellular processes such as differentiation, growth, apoptosis, immune reactions and angiogenesis (2, 6). This factor is involved in the synthesis of connective tissue components including collagen, glycosaminoglycan, proteoglycan, fibronectin and osteonectin, in cells of periodontal ligament and many others cell types (5, 13). To date, studies have shown that all normal cells such as inflammatory cells, vascular endothelial cells, gingival fibroblasts, and epithelial cells can synthesize TGF-β, yet for research purposes this cytokine has been extracted from human placenta, platelets and bovine kidney (5, 6). Transforming growth factor β inhibits growth of epithelial cells, fibroblasts, endothelial cells, hepatocytes, neuronal cells and lymphocytes (3, 5). It acts as a stimulating factor for mesenchymal cells differentiation (3). Furthermore, TGF-β is a known degradation inhibitor for matrix proteins because it can increase the production of proteinase inhibitors and prevent the synthesis of matrix degrading enzymes such as collagenase. Thus, it reduces collagen degradation (2, 5, 14, 15). Transforming growth factor β is the most potent growth inhibitor for epithelial cells, endothelial cells, fibroblasts, neuronal cells, lymphocytes and hepatocytes (5, 13). It has important effects on bone formation that appears to be related to the bone cell source, applied dose and environmental factors (5, 16). The TGF-β is a 2500 Da dimeric polypeptide, which includes two chains of amino acids linked together via disulfide bonds (16). Three isoforms of TGF-β (TGF-β1, TGF-β2 and TGF-β3) have been detected in mammals, with TGF-β1 being the most abundant (2, 5, 16). These isotypes are encoded by different genes and share many biological activities that are qualitatively similar in most cases (5). Transforming Growth Factor β is a regulator cytokine that induces growth and differentiation in many types of cells and is able to inhibit immune response by suppression of lymphocytes (3, 12). It potentially has immunosuppressive function and down-regulatory role in transcription of some cytokines such as tumor necrosis factor alpha, metalloproteinases and interleukin-1 (17). Furthermore, TGF-β1 mRNA expression probably occurs in regulatory T cells of gingival tissue. It might mediate periodontitis by engagement in receptor activator of nuclear factor kappa B ligand (RANKL), yet to date this hypothesis has not been established (12). In addition, TGF-β1 particularly increases expression of osteoprotegerin by bone marrow stromal cells. As a result it is thought that regulatory T cells have a regulatory and inhibitory role in destruction of alveolar bone during periodontal diseases (12). Transforming Growth Factor β is present during both early and late stages of periodontitis, therefore it is considered that this protein has both therapeutic and pathological roles (4). Studies demonstrated that TGF-β1 in Gingival crevicular fluid (GCF) was significantly elevated in gingivitis and periodontitis compared to the controls. It has been suggested that this cytokine is involved in the development and severity of periodontal diseases (6, 18). The levels of TGF-β1 were significantly elevated in serum and saliva of periodontitis patients (19). Presence of TGF-β1 in GCF leads to destruction of gingival epithelium by inducing apoptosis in epithelial cells, therefore this molecule can be used as a target for monitoring of periodontitis progression (6). Today, there is no doubt that all diseases have both environmental and genetic origins. Allelic variation in host genes causes genetic components that induce disease processes. Rate of host response is a result of interaction between environment and genotype (3, 20). Many studies have indicated that genetic background has an important role in susceptibility to periodontal disease. Studies on twins support this hypothesis (3, 4, 21). Polymorphic gene sequences of cytokines are associated with capacity of their production and vary between individuals and populations. Gene polymorphisms of cytokines could potentially be a marker for detection of susceptibility to human infectious diseases (12). The role of genes in incidence of chronic periodontitis has been confirmed, yet familial distribution and transmission of this disease typically follow a complex pattern (4). The gene sequence located on chromosome 19q13 codes TGF-β1 and contains seven exons. The product of this gene is a precursor protein with 390 amino acids (4, 17). Promoter polymorphism at position -509 C/T has an association with concentration of TGF-β1 in plasma (4). The C homozygote of (-509) C/T allele in TGF-beta1 has an association with increased mRNA expression and high levels of TGF-β in the serum (22). In Brazilian Caucasians, the TGF-β1 (-509) C/T polymorphism was correlated with CP susceptibility, yet single nucleotide polymorphism (SNP) was not associated with severity of CP in Czech Caucasians (4). Yoshimoto et al. showed that TGF-β1 induced apoptosis in gingival epithelial cells and therefore led to the destruction of the gingival epithelium, resulting in the progression of periodontitis (6). Our previous study showed that there is a strong correlation between TGF-β1 29C/T gene polymorphisms and quantitative parameters of interdental papilla in CP patients, and that the 29T allele in comparison with the C allele could increase the risk of CP (1, 2). We found a statistically significant association between the frequency of T alleles and volume density of the collagenous matrix and blood vessels in CP patients (1). A previous study by the present authors showed no relationship between TGF-β1 polymorphisms at positions -509 C/T and chronic periodontitis, and the frequency distribution of genotypes and alleles were not significantly different between subjects with chronic periodontitis and healthy subjects (2). More studies are required to verify the association of TGF-β1 polymorphisms with the level of tissue breakdown and periodontal disease progression (1, 2). To date, there are no data concerning quantitative parameters of gingival tissues in individuals with TGF-β1 -509 C/T polymorphisms (2). In the present study, quantitative parameters of interdental gingiva in patients with CP, having TGF-β1 -509 C/T gene polymorphisms, were investigated. The aim of the present study was to determine interdental gingiva tissues breakdown in chronic periodontitis patients with TGF-β1 -509 C/T polymorphisms. The patients were selected on the basis of the criteria defined in the international workshop for classification of periodontal diseases and conditions (23, 24). Patients and controls characteristics and selection criteria are listed in our previous study (1). This case-control study was done on 45 CP patients, and 15 healthy individuals. All subjects were exclusively Iranian from the region of Sistan and Baluchistan. Patients with chronic periodontitis were examined at the Periodontology department of the dentistry clinic of Zahedan university of medical sciences (ZUMS). The average age of the patients was 28.49 ± 5.859 (23 females and 22 males). Fifteen healthy individuals (seven males and eight females, aged 26 to 57 years; mean age: 39.5 years) were included as controls. Two milliliters of peripheral venous blood from each participant was collected in tubes containing Na-Ethylenediaminetetraacetic acid (EDTA) for genetic analysis and detection of TGF-β1 -509 C/T gene polymorphisms. Tissue samples of individuals were obtained during gingival surgical operations using a previously described process (1, 9). TGF-β1 (-509) C/T gene polymorphisms were detected by the Tetra primer Amplification Refractory mutation system-polymerase chain reaction (T-ARMS-PCR) method in our previous study (2). Forty-five interdental gingiva tissue samples from CP patients based on their previously known genotypes were divided to three case groups (6 TT, 21 TC, and 18 CC). Tissue preparation was done, according to a previously described protocol (1). The gingiva in the control group (n = 15) was obtained from the persons with clinically healthy gingiva that had tooth extraction for orthodontic or prosthodontic treatments. The gingival tissues were fixed, processed and embedded as described in our previous study (1). Next, each interdental gingiva sample was exhaustively sectioned into 4-μm-thick sections and 10 - 13 sections were sampled from each specimen by systematic uniform random sampling (SURS), as demonstrated previously (1, 10, 15, 25). The slides were deparaffinized, hydrated in distilled water and finally stained according to the Masson Trichrome staining protocol (1). Stereological analyses were done on slides that were mask-coded. Cavalieri’s principle was used to estimate the volume of interdental papilla. In this method, six to eight fields were selected via SURS on each sampled section, by movement of the microscope’s stage in X and Y directions using dint of the vernier scale of a projection microscope. Then a test system of points was superimposed on these fields, and points hitting the various components of the tissue were counted. The details of this method were described in our previous studies (1, 9, 26). Data were presented as means ± standard deviation (SD) for each investigated parameter. Tukey’s post hoc test for multiple comparisons was used to compare differences between groups. The significance level was set at P < 0.05. All statistical analyses were performed employing the SPSS software version 16.0 for Windows software system. Pearson’s correlation test was used for determination of correlations among gingival quantitative parameters and number of T alleles. The demographic data showed that the mean ages of patients with CP and healthy subjects did not differ between the two groups (respectively, 42.2 ± 8.93 and 39.5 ± 8.19). There were no significant differences between subjects with periodontitis and controls regarding ethnicity and gender. Histological structure of controls and CP patients are shown in Figure 1. Quantitative analysis of gingival samples indicated that there were statistically significant differences in the volume density (Vʋ) of epithelium and connective tissue between cases and control, as indicated in Figure 2 (36.7 ± 4.32 and 63.3 ± 4.32 in CP, and 27.8 ± 3.73 and 72.2 ± 3.73 in controls, respectively, P < 0.0001). A. Patient gingival tissue: original magnification X 10, loss of collagen bundles and accumulation of immune cells. B. Healthy gingival tissue: original magnification X 10, integrity of collagenous matrix, and low cellular population. C. Patient gingival tissue: original magnification X 40 D. Healthy gingival tissue: original magnification X 40. Vʋ of collagenous and non-collagenous matrix, and blood vessels was significantly different between control and chronic periodontitis groups (respectively 35.4 ± 7.14, 11.7 ± 5.48 and 16.3 ± 4.56 in CP, and 58.3 ± 3.35, 6.6 ± 2.59 and 8.8 ± 1.82 in controls (Figure 2)). There were no statistically significant differences in the Vʋ of epithelium and connective tissue of gingiva, and non-collagenous matrix between TT, TC and CC groups (Table 1 and Figure 3). There were statistically significant differences in the Vʋ of collagenous matrix, non-collagenous compartment and blood vessels between TT, TC and CC genotype groups (Table 1 and Figure 3). a The values are presented as mean ± standard deviation (SD). b CI, Confidence interval for mean of volume densities; NS, Not significant. c Significant compared to TC genotype. d Significant compared to CC genotype. e Significant compared to TT genotype. f Significant difference between the three genotypes. Results of the present study demonstrated that quantitative parameters of interdental gingiva between the patients with CP and healthy subjects were different statistically, as indicated by our previous study. There was a statistically significant difference in the Vʋ of gingival epithelium and connective tissue between the patients with CP and the healthy controls. Volume density of epithelium increased in patients with CP, which may be due to infiltration of inflammatory cells and hyperplasia in epithelium (1). The Vʋ of collagenous matrix in the healthy human gingival samples was in agreement with the results of previous studies (1, 9). Chronic periodontitis is an inflammatory disease triggered by pathogenic microorganism of dental biofilm, and is characterized by a destructive process in the periodontium (15, 27). This common inflammation affects up to 90% of the global population and has associations with major systemic diseases including cardiovascular disease, diabetes and autoimmune disorders (27). A pivotal factor for initiation of periodontal diseases is microbial dental plaque, and its progression and severity, affected by environmental and genetic elements (3, 17). Host response to bacterial infection depends on differences in immune reactions that genetically vary between individuals (3). Cytokine gene polymorphisms in the pathogenesis of periodontal diseases have been widely investigated by previous studies (2, 10, 19, 28). Cytokines play an essential role in degeneration and regeneration of tissue (15). Transforming growth factor is an anti-inflammatory cytokine, which acts as an anabolic factor in connective tissue remodeling (25, 27). One of its isoforms is TGF-β1 with many functions including growth, cell differentiation and production of matrix components. Transforming growth factor β1 promotes synthesis of extracellular matrix and increases collagen formation. All of these functions give it an important role in progression of periodontitis (16, 25, 27). The main macromolecules of gingival connective tissue are collagen bundles that have a great role in gingival tissue integrity and reduction of their density may indicate the severity of periodontitis (1, 29). Transforming growth factor β1 is a chemotaxis inducer for monocytes, mast cells, neutrophils and lymphocytes and is a primordial mediator for T-cells (27). Furthermore, TGF-β1 has eight identified polymorphisms, which interfere with its transcription and affect the its secretion and function (17). Gene polymorphisms of TGF-β1 have a correlation with susceptibility to systemic disorders such as heart diseases, osteoporosis, diabetes and rheumatoid arthritis, which have a close connection with periodontal diseases (17, 27). Therefore, it seems that TGF-β1 gene polymorphism could be a factor for susceptibility to periodontitis as well. Polymorphisms of TGF-β1 are different between populations (17). Production of TGF-β1 could be a protective factor for tooth-supporting tissue during periodontal destruction by prompt remodeling of connective tissue and angiogenesis. However, biological function of TGF-b1 and reduced perfusion of periodontium are cooperated in the pridontal destructive process. During the acute phase of CP, upregulation of TGf-β1 in patients probably counterbalances the destruction process in inflammated gingiva (27). Gene polymorphism of TGF-β1 (-509) C/T is located in the promoter region and is related to the start site of transcription, found to result in increase in plasma concentration of TGF-β (22). It was reported that genetic variants have a correlation with increased risk of periodontitis progression and could contribute to subject’s risk profiles (17). Atilla et al. (17) suggested that the TGF-β1 (+915) polymorphic allele could be related to CP in a sample of Turkish population. Yamada et al. (30) found a significant correlation between the TGF-β1 (-509) C/T polymorphism and bone mineral density in postmenopausal Japanese females. An immunohistochemical study by Matarese et al. (27) indicated that TGF-β1 might contribute both to inflammatory regulation and remodeling events during periodontal disease. They documented that down-regulation of TGF-β1 during periodontitis plays a pivotal activity in bone resorption and tissue destruction (27). Higher levels of TGF-β1 mRNA in gingival tissue were found in patients with CP in comparison with healthy individuals (15). Researches on remodeling and regeneration of gingival tissue in periodontal diseases are limited (15). We were not able to find any other study investigating the association of TGF-β1 -509 C/T polymorphisms (in patients with periodontitis) and gingival tissue breakdown in different ethnic groups. Our results could reflect differences in the role of TGF-β1 gene polymorphisms in the pathogenesis of different periodontal diseases. Previous studies have shown that cytokine and receptor gene polymorphisms are related to quantitative parameters of interdental gingiva (1, 9). Previously, we found that there is no significant association between TGF-β1 (-509) C/T gene polymorphism and susceptibility to CP (2), however in the present study it was demonstrated that this gene polymorphism could be related to severity of CP and level of tissue degradation. Results of the present study showed that there is a statistically significant difference in some quantitative parameters of interdental gingiva, including connective tissue components, between TT, TC and CC polymorphisms of TGF-β1 (-509) C/T gene in patients with CP. Our other study on total blood samples of CP and controls showed that there was no correlation between TNFα (-308) G/A polymorphisms and CP. Histological quantitative analysis on gingival tissues of patients with different gene polymorphisms also showed that there were no significant differences in quantitative parameters of interdental papilla (28). On the other hand, in another study we found no association between CP and TGFβ1 (29 C/T) gene polymorphism, whereas there were significant differences in quantitative parameters of gingival tissue in CP patient (1). when there were no association between CP and gene polymorphism , histological parameters of gingival tissues of patients with different genotypes or polymorphisms were not statistically different from each other (1, 2, 9, 31), yet the present study was in contrary with our previous findings. We found that although polymorphism in TGF-β1 (-509) C/T was not related to incidence of CP (2), there is different rate of gingival tissue breakdown between patients with different genotypes. This indicates that more studies are needed in this concern. Periodontitis has a complex nature, and interactions between immunological, environmental, microbiological and genetic factors have an impact on its progression and severity (3, 31, 32). Many studies have shown that a marker for a certain phenotype for disease susceptibility in a population may not indicate risk of disease in different population samples (1, 3). One reason for different results may be the prevalence pattern of periodontitis that differs between populations. Geography and ethnic origin result in various allele frequencies worldwide (1-3). In addition, our previous findings probably were due to population stratification that lead to spurious differences in allele frequencies between patient and control groups (17). However, more comprehensive studies on genotype and allele diversity of TGF-β1 gene polymorphism considering larger groups of patients are necessary. 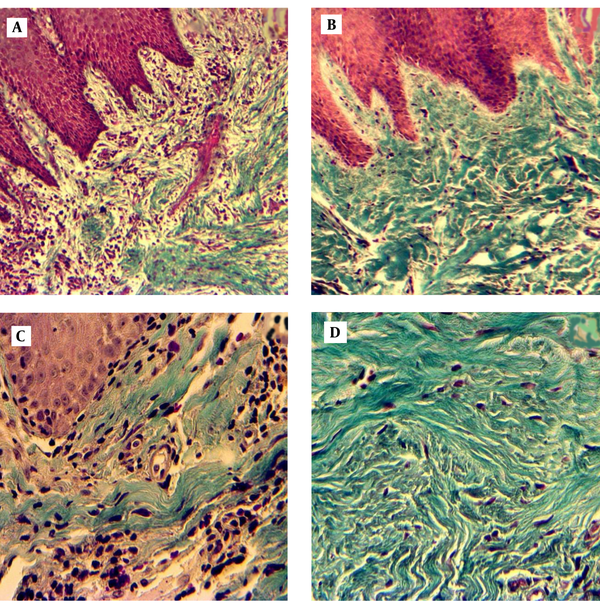 Additional investigations on immunohistochemical changes, serum level and gene expression in these different polymorphisms would assist better comprehension of their molecular impression and justification of histological changes. Further studies may provide new insight into biology of chronic periodontitis. The present study was a quantitative histologic type and demonstrated that there is a strong association between TGF-β1 -509 C/T gene polymorphisms and quantitative parameters of interdental papilla in patients with CP. Undoubtedly more extensive studies on larger groups of patients and other ethnic populations should be undertaken in order to analyze the putative relevance of the TGF-β1 polymorphism in the pathogenesis of periodontitis. This project was funded by Zahedan university of medical sciences, grant number 112-26-2011. The authors acknowledge the patients and the healthy participants who willingly participated in this study. None of the authors had any financial or other interest in the dissemination of this article. The authors report no conflicts of interest related to this study. Authors’ Contributions: Zahra Heidari and Hamidreza Mahmoudzadeh Sagheb conceived and co-designed the study, supervised all the experimental designs, analyzed and interpreted the results and the manuscript. Nadia Sheibak contributed to the study design and coordination, statistical analysis and drafted the manuscript. All authors read, modified and approved the final version of the manuscript. Financial Disclosure: None of the authors had any financial or other interests in the dissemination of this article. Funding/Support: This project was funded by Zahedan university of medical sciences, grant number 112-26-2011.